Poetry is an important tool for remembrance. It helps unite people in expressing their feelings of sadness and shared loss. One of the most important historical poems about Armistice Day is the poem “In Flanders Fields.” Let’s read it now. 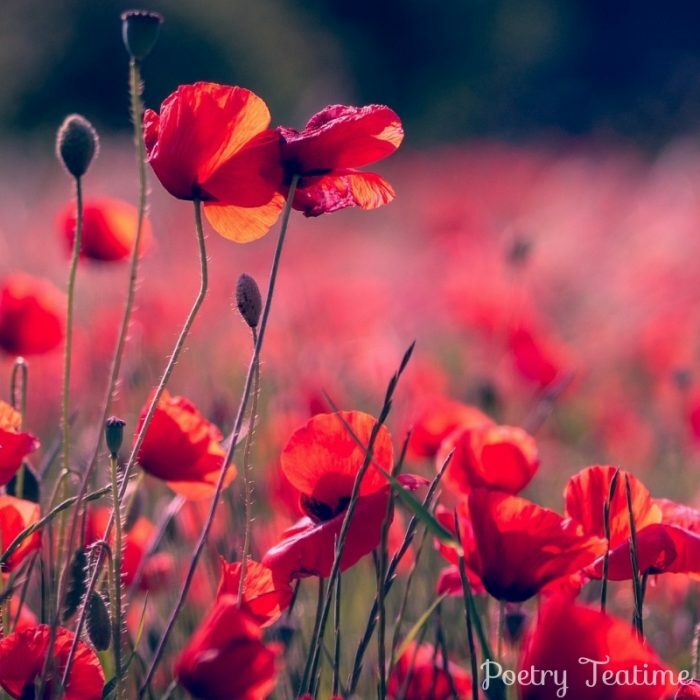 This poem’s imagery of poppies covering the battlefield is such a powerful one because of the contrast between life and death, beauty and suffering, action and rest. If you visit those fields today, you’ll see the deep red of the poppies covering the ground as far as the eye can see. Today, poppies have become one of the great symbols of remembering WWI, in part because of McCrae’s poem. Can you think of other moments in history when songs, artwork, or poems have expressed the deep sadness that a whole nation or group felt? As a parent, think of a moment that has deeply touched you in your lifetime. Take some time to talk about it with your family. How did you and others remember what happened and honor those lost? For today’s teatime, consider taking a minute of silence (or a time that works for your family) to remember veterans and those who have died in wartime. Silence shows respect towards those who have served and honors their sacrifices. As a memorial activity, cut out red poppies using construction paper or a template like this one from Craft n Home. On those pieces of paper, write out things you are grateful to veterans for. You can put those poppies on a wreath or at the center of your table. If you know any people in military service, consider writing them a letter to thank them for what they do. We would also highly recommend looking up issues that veterans face today. Not all remembrance should be of the distant past. Many veterans struggle to adjust back to normal life, often with lasting consequences to their physical and mental health. Get more information here at US Veterans Magazine and here at Military Spot. 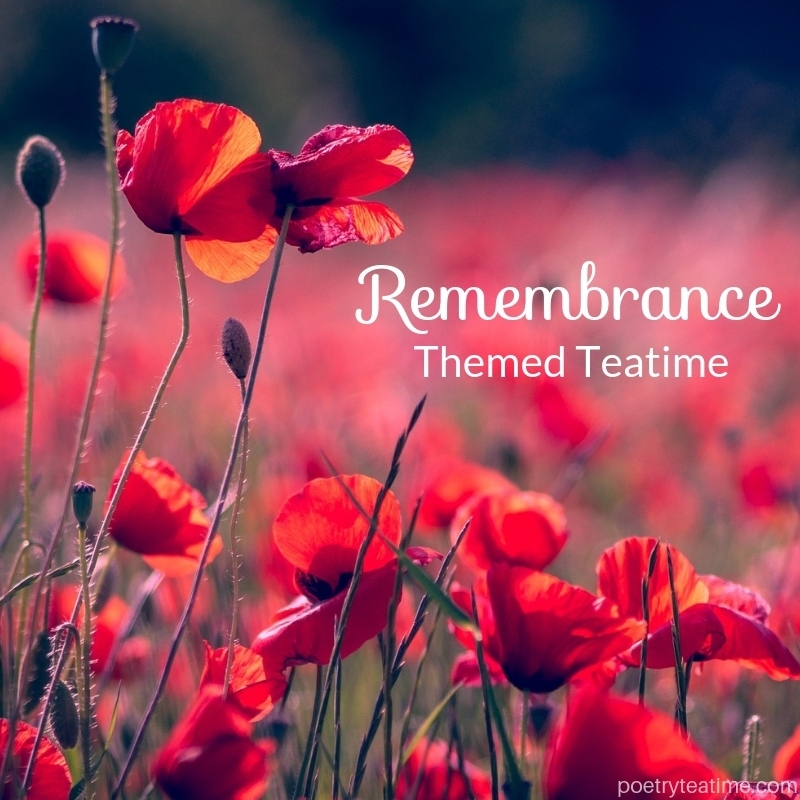 While today’s teatime isn’t focused on making cute treats or fun drinks, you can incorporate Remembrance Day elements to your teatime fare. 1916 Trench Cakes: Learn about how mothers sent their sons “trench cakes” through the mail system and bake your own trench cake with this recipe from Baking for Britain. Ration Book cooking: While ration books were a product of WWII rather than WWI, they’re still an important part of wartime memories. You can check out this multi-day ration book challenge from Lavender and Lovage to see how people made food stretch farther during wartime and find recipes like the National Wheatmeal Loaf used in the UK. Teatime in War: Did you know that, in WWII, the British government bought the world’s entire supply of tea? The tea helped soldiers drink water that didn’t always taste great. Find out more wartime tea facts here at Vintage News. If you have older teens, take some time to read some of the Veterans Day Poems collected at Poets.org.